When tutoring your children about time you should be aware of the difference between recorded time (when something happens) and intervals of time (the time between two events). An ability to tell and record time does not necessarily mean that your children will easily be able to work out differences in time. Since time is not represented using a decimal system, the difference in time between 2:05 and 1:55 is 0:10 as opposed to 0:50. In other words, conventional subtraction suggesting that 2:05 - 1:55 = 0:50 is incorrect. A good alternative to subtraction (which will still work sometimes e.g. 2:30 - 2:15) is to use an "add-on" method. This is best done using or visualizing a number line. A number line is an excellent tool when working with elapsed time. This document contains pre-made time number lines similar to the one above. Your children might also find it helpful to sketch their own number lines similar to the example below. The two examples below show how a number line can be used to help determine elapsed time. The first one is relatively simple and shows two one-hour "steps" that add together make 2 hours. 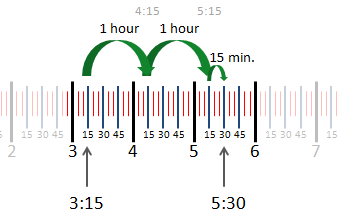 The second example shows how the number line helps when time spans 12 noon or midnight. How long to the next hour and how long from there? Once your children are comfortable with whole hours, they can use these as "stepping stones" on the number line and add-on smaller "chunks of time" to find the total elapsed time. 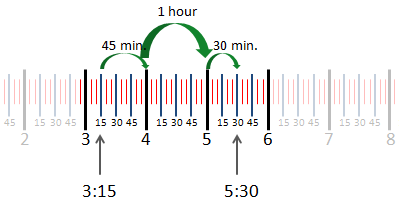 The "how long to the next hour" method shown above is not always the best; the example below shows that it can leave an extra step (a 45 minute plus 30 minute addition requiring a conversion to hours and minutes). As shown below, there are other, often better methods for finding elapsed time. Another way to add-on with the number line is to take as many 1 hour steps as you can before going past the end time. In this example the first step is from 3:15 to 4:15. The second step is from 4:15 to 5:15. Another one hour step would take us too far along the line so we stop after 2 hour steps and then find what needs to be added on to get to the end time. Here we need a 15 minute final step to give has a total elapsed time of 2 hours 15 minutes. Not surprisingly there can be difficulty overcoming the ..9, 10, 11, 12 , 1, 2.. sequence of hours. The time number line helps as we can use 12 as a "stepping stone" and break the elapsed time into manageable "chunks of time." The "chunks of time" used as "steps" in the examples above might not be the same as those chosen by your children. There are no rules to these methods. Your children can identify and use whatever "chunks of time" are easiest for them. The final example below is an example of how this might work. Your children might be comfortable taking the steps from 7:45 to 9:45 to 10:15 and finally to 10:21. Or maybe they will be more comfortable going from 7:45 to 9:45 to 10:00 to 10:21. Or maybe they will take different steps altogether. Discuss events with your children that are meaningful to them. For example, at school, ask how long they get for a lunch break. Other examples include the length of time their favorite sports games take or the length journey times to places they enjoy going to. Make sure they are not confused by words that are used to measure distance e.g. "how long" and "length of time". These discussions are an opportunity to ensure they know typical key words that might appear in word problems. Examples of some keywords are shown below. The documents below each contain 4 worksheets. Elapsed Time #1 - between whole hours e.g. 4:00 p.m. to 7:00 p.m.
Elapsed Time #2 - between half-hours hours e.g. 2:30 a.m. to 6:00 a.m.
Elapsed Time #3 - between quarter hours e.g. 2:15 p.m. to 6:45 p.m.
Elapsed Time #4 - with 5-minute intervals e.g. 8:55 a.m. to 2:20 p.m.